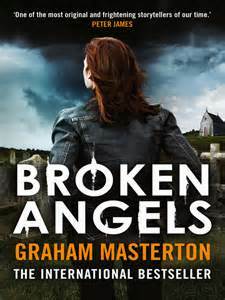 I first read Graham Masterton many years ago when his main genre was horror which he did very well indeed so it came as a surprise when a few weeks ago I came across something recent by him in the crime genre set in one of my favourite places in the world; County Cork in Ireland. I picked this one up from my local bookshop and started to read little realising that it was book two in a series of five (I am reading book one now and will start book three soon afterwards followed by book four) so far but once I had started I could not put it down for I was hooked on familiar places, the culture and the way Cork people talk with their sing-song accents and speech. I used to live in Ireland and intend to move back within three years for good with any luck and Cork feels like home to me, especially Kinsale where everything washes away from my mind and soul. Anyway, I digress! The story is set around Priests being abducted, tortured and murdered in horrific and gruesome ways leaving Detective Superintendent Katie Maguire of the An Garda Síochána in Cork to solve the case along with her team. Amongst all of this she is trying to juggle her personal life and the politics of the job as well. This book is fantastic and I have not read anything by Masterton in many years so it felt like meeting an old dangerous friend once again. It is quite gory in parts as is his way with writing death scenes so if you do not have a strong stomach and are not keen on graphic violence then this may not be for you but if you do not mind it then I highly recommend you read this. The fifth in the series is due out in October with the sixth called Buried following in February 2016 as well as other projects he is writing too. He is certainly prolific and the pace never lets up in his books. I recommended this series to a friend who is from Cobh in Cork where Katie Maguire lives and she has devoured them all in quick succession and wants the other two NOW she enjoyed them so much. If these were made into a television series I think it would be too strong and gut-wrenching so it would have to be toned down quite a lot with the murders but everything is here and it reads well. If anything, these stories will make me yearn to be back in Ireland, indeed Cork sooner than I plan although with the violence of course! Buy, read and enjoy and keep book shops on our high streets.